For many centuries, orcs were the backbone of the Empire’s military might. They were also possibly its greatest liability, with resentment constantly brewing within the orc ranks at being treated as slaves and expendable pawns, commanded by leaders for whom they had little respect: weak and cowardly magicians, contemptuous and cruel generals, and effete and capricious nobility. Many warned that one day the orcs would break their chains and shackles, and rise up in fury to seek bloody vengeance against their tormentors. But the Empire did not heed these warnings. There was always a new threat to fight: beastmen invading across the borderlands, insurrection in the Nine Cities, and the ever-present undead threat from the north. At the very least, the Empire should have prepared for the possibility of an orc uprising, or begun to make some kind of amends for the evils it perpetrated upon the orcs for the sake of its prosperity and security. Because the terrible day all feared has come, and now the Empire burns. Born to Kill joins the other installments of the Victims of the Demon Lord by presenting orcs in all their blood-soaked glory. In its pages, you’ll find more information about the orcs’ origins, their place in their world, and how they won their liberation. Furthermore, Born to Kill offers variant character creation rules to produce highly detailed orc characters, as well as a brutal new expert path: the ravager! 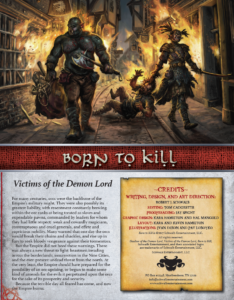 Buy Born to Kill as a PDF from Schwalb Entertainment or DriveThruRPG!